Our FAQs sections features answers to some of the questions the Tregunno Group team is asked most often about home, property, auto or commercial insurance in the Burlington and Hamilton areas. Tickets: Lots of tickets means lots of surcharges. Age: more and more companies are using Individualized Rating Programs that take many personal details into account, however, the fact remains that principal drivers under 25 years old can be expensive. The same is true for drivers over 75 years old. Prices start to climb. Postal Code: Even though you may be a cautious and responsible driver your neighbours might not be. Your company will always pay for your injuries and damages if coverage is purchased, regardless of whether you caused the accident or not. If your neighbours cause a lot of accidents, chances are you’ll be involved in one. Your rates reflect this. Insurance Experience: Some companies give clients rating by the number of years they have been licensed, other companies will rate based on number of years of verifiable insurance. The less experience you have, the more expensive your rate will be. Lucky for you, Youngs has 30 companies to choose from, so even new drivers can have competitive rates. No-fault insurance is a complete misnomer. The ‘no-fault’ refers to the principle that no matter who caused the accident, your company will take care of your settlement. The good old days of suing and tying up the legal system with expensive lawyers and doctors are over. ..well kind of. Relying on the person who caused the accident’s insurance meant that if that driver didn’t have coverage, you were out of luck to get your car fixed or your back adjusted. Not fair! Now your insurance company takes care of you. Think BIG. Typically, the larger the vehicle the cheaper the insurance. This is because a major factor in determining auto rates comes from safety ratings. If you were to get hit by a Mack truck, would you rather be in a Suburban, or a Civic? Crown Victorias, and Minivans…. not cool, but will definitely keep money in your pocket when it comes to insurance rates. 3 years – from the day you pay it. If you get a ticket in May, but you don’t pay it until July, the clock starts ticking from July, for three years. Do red light camera tickets affect my record? No. There is no way to verify who the driver of the vehicle is. These tickets will not increase your insurance rate, but the fine is hefty. Can I let someone who isn't listed on my policy drive my car? Yes. You can let anyone you choose drive your car, but you are responsible for what they do in your vehicle. If an accident occurs, it will stay on your record, not the driver of the vehicle at the time. Be cautious! When is my deductible waived? You are always responsible for your deductible. It will be waived if you are found to be not at fault for the claim, and the other party involved has verifiable insurance. How is the replacement cost of my home calculated? An insurance calculator takes into account the construction details of the house, and gives an estimate of what it would cost to rebuild the house, brick by brick. This is not to be confused with the real estate value of your home. Land has real estate value, but it does not have insurance value. If your home burns to the ground, the land will still be there. Old homes can cost more to rebuild than new homes. Double brick and masonry construction is a lot more work than a wood frame home with brick veneer. Is the chip in my windshield free to repair? If comprehensive coverage is present on your policy, otherwise known as ‘fire and theft’ you have coverage on your vehicle for things like windshield chips, cracks, and the theft of your vehicle. If the windshield chip can be filled, there is no charge. If it is a crack, the whole windshield will need to be replaced, and you will be responsible for your deductible. 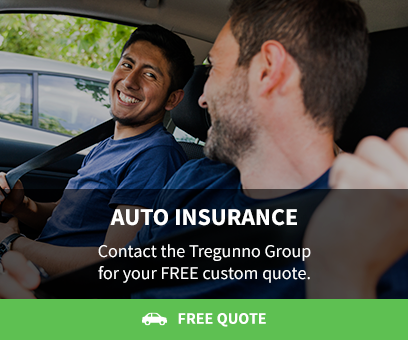 Contact Tregunno Group today. We're happy to help!